Install, organize, and secure your cargo easily. 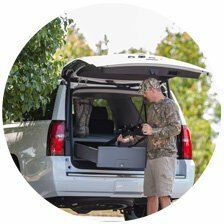 With room for your valuable hunting, occupational, and recreational cargo, the SUV Cargo Caddy™ is the best vehicle storage system for security and durability. 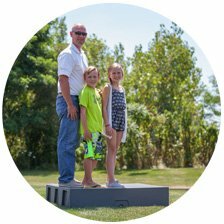 The SUV Cargo Caddy™ features a rugged, durable automotive-grade plastic with structural ribs on ALL surfaces for rigidity and strength, matching carpet covers a 3/8" plywood insert for stability, and an easily slidable drawer. 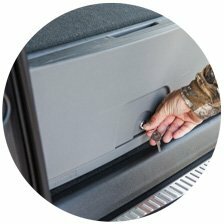 Keep your guns, ammo, and other valuables out of sight and secure in all SUV Cargo Caddy™ models with the included key lock. All SUV Cargo Caddy™ models have removable dividers to adapt to your storage needs. All sizes can be easily installed by one person. No assembly is required. The SUV Cargo Caddy™ has been the premier vehicle storage solution since 2002. Our goal is simple - to create a tough, functional storage system for law enforcement, outdoor enthusiasts, and anyone else in need of secure and organized in-vehicle storage. Copyright 2018 SUV Cargo Caddy™. All Rights Reserved.